From 1886 to 1893, new unions rose up in Britain to represent the previously unrepresented. Militant women workers defeated a respected match manufacturer, Bryant and May, in 1888. More than a hundred thousand dockers struck and paraded through London in 1889. All through these years, gasworkers, outworkers, rubber workers and general labourers, among others, all struck, unionised, and won. The “new unionism” changed the British labour movement forever. Its leaders, men and women of the Left, fought for supremacy in the Trades Union Congress with the “old” union leaders, who still clung to their pocket watches, their Liberal Party sympathies and in some cases their seats in Parliament. Within several decades, the “new unionists” turned a trade union movement of largely privileged, skilled workers into a mass movement of most working people. Their political work led to the Independent Labour Party in 1893, and the British Labour Party less than ten years later. Fast forward to 2018, and the “new” unions of dockers, gasworkers and labourers have become the largest and most powerful British unions: Unite, Unison, GMB and others. The leaders of these unions, like the “old” unionists of the 1880s, have become an Establishment within the British labour movement. They wield great influence in the Labour Party. They command small armies of officials, and they oversee millions of pounds of members’ money. Yet they have failed to halt the decline of organised labour. Like the leaders of the old craft unions in the nineteenth century, they have no clear plan to organise the great mass of lowly-paid workers below them. IWGB workers protesting at John Lewis in August 2012. UVW protest at the Ministry of Justice in January 2019. To bring those workers into the labour movement, we need a new unionism for the twenty-first century. And we have the seeds of such a movement in two new unions, the Independent Workers of Great Britain (IWGB), founded in 2012, and United Voices of the World (UVW), founded in 2014. 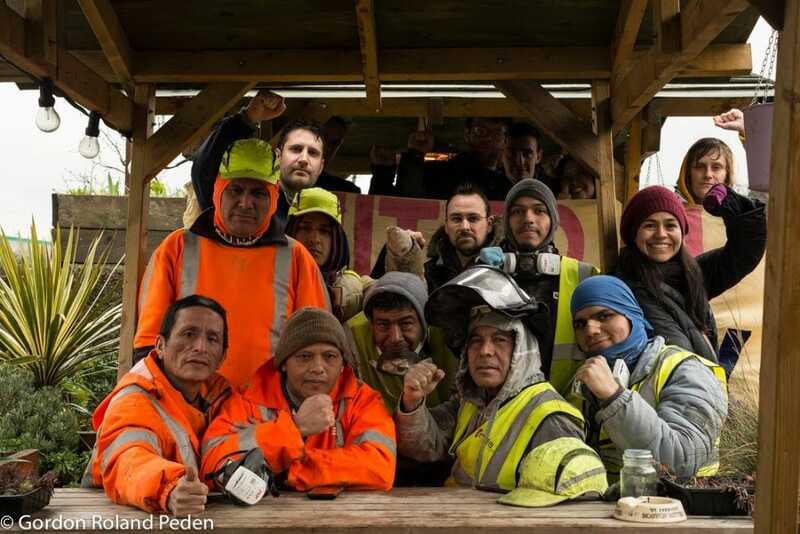 Both unions have emerged in reaction to the failures of larger unions to organise successfully among precarious, largely migrant workers across London. Both tap into a longer tradition represented, in the UK and the US, by the Industrial Workers of the World, with its emphasis on direct action, democratic practice, and solidarity—and both have succeeded where bigger unions usually fail. As we contemplate the ongoing decline of British trade unions, and as Americans consider their next move after the Supreme Court’s Janus vs AFSME decision, the IWGB and UVW point towards an alternative way of organising, fighting—and winning. 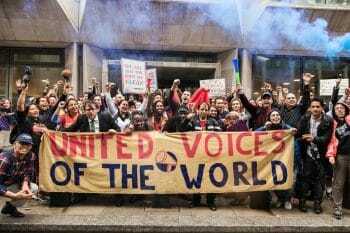 I talked with Henry Chango Lopez, President of the IWGB, and Petros Elia, former General Secretary of the UVW, about how their alternative works, and what we can learn from it. The Independent Workers of Great Britain and United Voices of the World both work among what we might call the armies of the night: the people, many of them women, migrants and people of colour, who clean the offices, replenish the warehouses, and keep the means of production in good working order from the evening to the early morning. Yet these unions aren’t industrial vampires. They also number couriers, food delivery workers, foster care workers, and other daytime workers among their members: the modern equivalents of the armies of porters, domestic servants, factory hands and dock and day labourers who entered the new unions of the 1880s and 1890s. The IWGB and UVW both emerged from disagreements over how best to organise them. The original members of the IWGB had worked in the Justice for Cleaners campaign, started by Unite, the largest UK union, in the 2000s. They developed concerns about the top-down and undemocratic nature of Unite’s campaign, and joined the Industrial Workers of the World, a union with a long pedigree in the US and UK. They soon left the IWW, partly because they disagreed with its political line, and partly because they felt that each branch should have more autonomy regarding its campaigns and funds. They formed the Independent Workers of Great Britain in August 2012. Their first major victory owed much to the failings of the big unions. 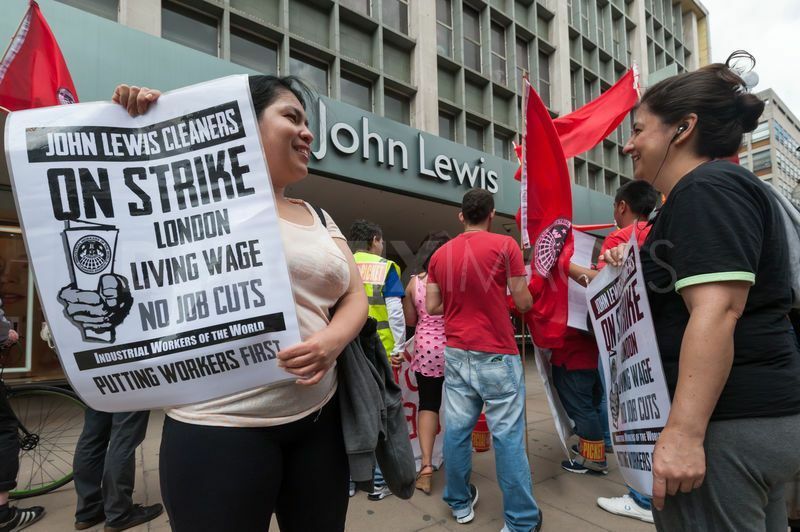 From 2010, mainly Latin American cleaners at the University of London began to campaign for the living wage, and after a wildcat strike they joined up with Unison, the second-largest British union. Yet they soon became suspicious about the commitment of the higher ups to their cause. Having broken out, the IWGB led cleaners at the Royal Opera House, the department store chain John Lewis, and at other big-name employers. They now organise foster care workers around the UK. They have succeeded with couriers, first at CitySprint, one of the UK’s largest delivery companies, and then at eCourier and Mach 1. Aside from winning higher wages and other demands peculiar to the industry, the IWGB challenged the labelling of couriers as “independent contractors,” not workers, a legal distinction that saves many companies from granting sick pay, holiday pay, and other basic rights to their employees. The same fight pitted the IWGB against two global giants in the so-called “gig economy”: the food delivery service Deliveroo, and the car-hire firm Uber. Both companies make free use of the “independent contractor” tag, and employ it to avoid meeting or recognising the IWGB as the representative of Uber and Deliveroo workers. On 15 June, 2018, the IWGB won an appeal to the High Court against Deliveroo so that it could pursue collective bargaining with the company. The decision has enormous implications for all those who work as “independent contractors,” and might curb some of the more exploitative practices now allowed under UK employment law. 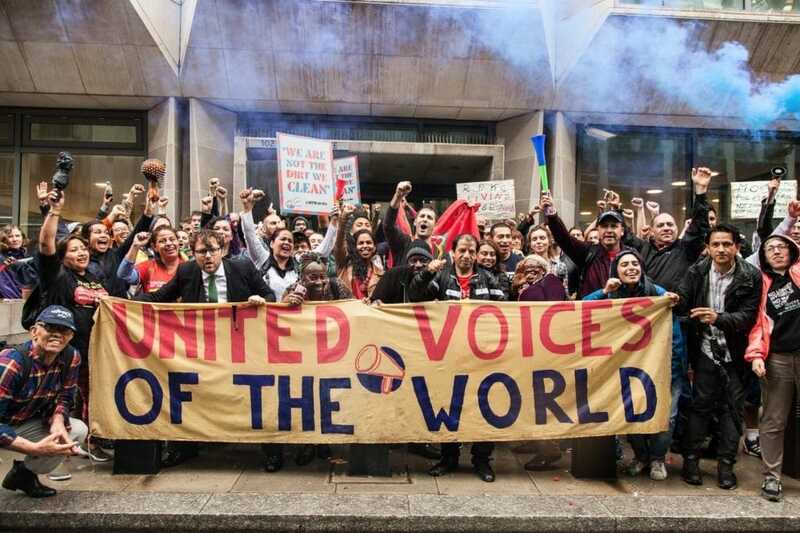 The United Voices of the World was not, according to its previous General Secretary, Petros Elia, a split from another union, although it remains closely related to the IWGB. Founded in 2014, its first campaign was in 2015, with cleaners at the Barbican—a giant theatre complex in central London owned by the City of London (the capital’s financial district). After dramatic protests, occupations of parts of the Barbican complex, and solidarity from artists, trade unionists and some MPs, cleaners there won the London living wage in 2016. Their exploits since then include the longest strike in the history of the City of London, with cleaners at 100 Wood St, home to the British headquarters of JP Morgan Chase and Goldman Sachs. 61 days of protests, flashmobs and picket lines reminded the bankers and other Masters of the Universe that the class struggle goes on. They also fought one of the smallest strikes in British history in 2017, when two cleaners at the HR Owen showroom, home to Ferrari and other luxury cars, eventually won the London living wage. They now prepare simultaneous actions with cleaners at the Kensington and Chelsea Council (owners of the infamous Grenfell Tower), at the Ministry of Justice, and at HCA Healthcare, part of the largest private hospital group in the world. The IWGB and UVW are not merely breakaways from the big unions, or movements that happen to take a greater interest in the superexploited. They are separated from their larger counterparts by their tactics and style, just as the British new unions of the nineteenth century, or the American IWW of the early twentieth, stood in sharp distinction to the established unions of their time. Precarious workers live with fear—fear of underpay, of bullying, of harassment, and above all the fear of the sack. This fear is, as Petros Elia says, “off the charts.” Cleaners at the University of London, Henry Chango Lopez remembers, saw the supervisor as a tyrant. “To workers,” he said, “they are the law.” Few precarious workers have heard of unions, and those that have remain sceptical of their power to do something. The task of the IWGB (and UVW), as Chango Lopez explains, is to “change the mentality” of these workers and prove that collective action can beat the boss. UVW recycling workers on a wildcat strike. Photo credit: Gordon Roland Peden. Both unions draw on migrant networks. Most UVW members, and many IWGB members, were born in Latin America. Business at the UVW offices in Elephant and Castle, a centre of Latin American immigration to London, is conducted more in Spanish than English, and the IWGB and UVW both run English-language classes for Spanish speakers. They also draw on networks of black Londoners, and on other migrant communities. IWGB-organised South Asian taxi and Uber drivers in London, for example, put the union in touch with compatriots and fellow drivers in Leeds, allowing the IWGB to open another branch outside the capital. Both unions build their own communities. Organisers try to avoid what Elia describes as a “doctor-patient” relationship with new members: as soon as workers enter the head office of the IWGB or UVW they are invited to talk, at length, to lay out their grievances, and to think about how to resolve them. To give new members confidence, they are encouraged to meet as soon as possible with members steeped in previous campaigns. Union meetings double as social events, where camaraderie and the consumption of alcohol help to glue the union-as-community together. I was told on good authority at the UVW offices that their members are as formidable on the dancefloor as they are on strike. These new unions expect much from their members. As Chango Lopez says, “we let the workers run their own affairs.” Members keep full control over their campaigns, with organisers providing guidance and head office giving them legal support. They must do this because neither union has the money to do more. With low membership dues, both unions rely on grants from charitable foundations, volunteer work, and crowdfunding online to fill the financial gap. The IWGB has had some success here. They raised £13,000 online to support cleaners at the University of London, and £25,000 to support a legal challenge against Deliveroo. Yet these are shaky foundations on which to fight large and nasty employers. Chango Lopez and Elia agree that the active participation of their members is so vital, because they can’t afford to pay for organisers to do what the members now do for themselves. And they take active participation much further than most other unions. Elia explains that the UVW, like the IWGB, aims “to build as many links of solidarity as possible between members, and between workplaces.” The central office acts as a hub for the whole union. When one branch organises a strike, or protest, or an occupation, head office encourages the members of other branches to turn up, so that even the smallest action is backed in the streets by the maximum possible number of workers. Think of a wheel with many spokes leading out from the central union office, with a union branch at the end of each spoke. In the IWGB and UVW, solidarity passes down each spoke, through head office, and out again to whichever branch needs support. Solidarity is so important because the IWGB and UVW don’t shy away from direct action. The strike is not the option of last resort, as it is for many larger unions; Elia joked that for the UVW, it was the first. There is, he and Chango Lopez believe, no other way. Most of their members work for big outsourcing companies that are more likely to fire workers with grievances than hear them out, let alone concede their demands. Like their historical predecessors, the American Wobblies and British new unions, they strike because their employers listen to no other language than force. Elia and Chango Lopez both bemoan the attitude of some union officials who refuse to wake up to that basic fact. And their strikes are not orderly, conventional affairs. Strikes waged by the IWGB and UVW are a riot of colour, and a cacophony of chants, banging drums and calls to action from the loudspeaker. Reinforcements from other branches of the union, from supporters in other unions and political parties, and from anarchist groups such as Class War, square up against lines of police. This is where, as Chango Lopez puts it, invisible workers become visible—not to mention audible. They have proved so successful that some businesses now cave in at the first sign of a campaign, rather than risk their reputation in prolonged industrial conflict. In what Elia called an “Obi-Wan Kenobi vs Darth Vader dispute,” migrant cleaners recently won the living wage at the migrant-bashing Daily Mail newspaper without ever having to set up a picket line. The two unions do not completely agree on what to do next. The UVW disdains formal recognition agreements with employers, pointing out that cosy partnership deals led the bigger unions to their present mess. The IWGB is keener on recognition, mainly because it offers a cheap alternative to costly employment tribunal hearings. Even here, the IWGB presents its stand in clear distinction to the established unions: rather than treat recognition as an end, they see it merely as the means to press employers as hard and as often as possible. That distinction sums up the guiding principles of these two young democratic unions. Where the big unions often avoid workers with too many problems, the IWGB and UVW welcome them; where the big unions are overly bureaucratic, even undemocratic, and rest on weak ties with the membership, they are led by their members; where the big unions fear to strike, the IWGB and UVW boldly go. Yet the IWGB and IVW have their limits. Both unions remain small, because growing by word of mouth takes time. The IWGB boasts around 2500-3000 members, the UVW rather less. Both remain largely confined to London, except for foster carers and a handful of other branches, and both remain cash-poor. Chango Lopez freely admits that “we would like to be everywhere, but we don’t have the resources to do it.” Elia is equally frank: the UVW was “born on a cliff edge and remains on a cliff edge,” and has teetered more than once on the verge of insolvency. These unions are not about to become mass organisations to rival Unison or Unite, and their spokesmen say as much. Chango Lopez and Elia still have sympathy for the larger unions, or at least for many of their organisers and activists: they know how hard it is to convince workers to join unions. They have contacts with organisers from the Bakers’ Union, busy trying to organise McDonald’s. They willingly concede that some branches of Unite, Unison, GMB, the Rail and Maritime Union and other big unions have done good work with precarious workers over the years, even if they think their initiatives don’t come along often enough. The importance of the IWGB and UVW lies in what they can teach the rest of the British labour movement. They, after all, are fighting and winning at a time when the movement is in retreat. They prove that the strike remains a powerful weapon, even in the hands of the most vulnerable workers. They show how a union can draw on the talents of its members. They confirm old ideas on the left that democratic unions are stronger and more resilient than bureaucratic ones. The new unionists of the nineteenth century changed the spirit of the whole labour movement, not just the new unions. If the militant spirit of the IWGB and UVW can spread to the larger British unions today, we have the chance to regain what has been lost—and build a new unionism for the 21st century.